Fintech startup Fin2B on Thursday announced that it has opened an accounts receivable discount platform, serving as a supply chain finance solution, and is moving beyond the domestic market to enter the Asian market. Introduced in countries with well-developed financial markets about 10 years ago, supply chain finance is a set of advanced financial transaction solutions that utilize various business assets, such as accounts receivable, from business-to-business deals to raise corporate funds. “Our accounts receivable discount platform leverages supply chain finance to provide a new solution for financing small and medium enterprises, which have been relatively underprivileged in terms of finance,” Park said. The three executives of the startup, including CEO Park, are experts in economics, finance, and electronics engineering who once worked for Boston Consulting Group. Sellers and SMEs that want to raise funds based on accounts receivable owed by buyers prior to the expiry of such accounts receivable often find it difficult to obtain funds from banks or non-banking financial companies, because only the buyer has information on the accounts receivable. Recognizing this difficulty, Fin2B has devised a way to provide funds by verifying the credibility of companies and determining the authenticity of the accounts receivable. “Our core technology allows us to identify and verify accurate information on accounts receivable linked to the ERP (enterprise resource planning) systems of buyers. This technology enables not only the sellers but also investors to obtain more accurate information on accounts receivable, thereby helping sellers borrow money,” Park said. A seller that intends to raise funds based on accounts receivable owed by a buyer applies for a discount and enters into a credit transfer contract through the platform. Fin2B then promptly verifies the information and prepays up to 80 percent of the credit amount on the day after the application was submitted. The balance is paid after deducting all costs and providing discounts of between 5 percent and 10 percent. Fin2B has digitized the entire process, from discount application, credit transfer, and issuance of credit transfer notification (to the buyer) to prepayment and balance payment. 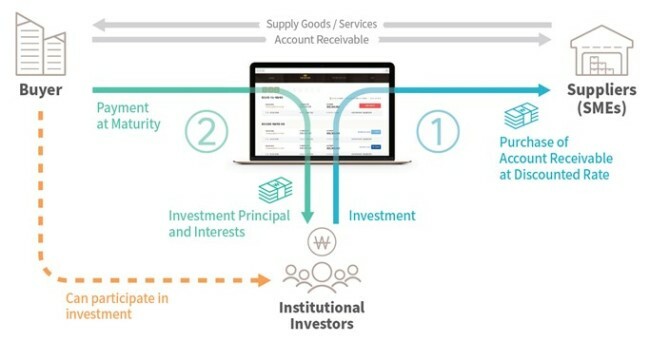 Fin2B’s platform business model is based on platform usage fees and fund management income, and the company plans to expand its supply chain finance service areas to include settlements receivable and rental receivable in addition to accounts receivable. In 2017, its first year of business, the company estimates sales of 200 million won ($180,000), which it expects to increase to 10 billion won by 2020. The Gyeonggi Center for Creative Economy & Innovation supports the overseas marketing efforts of Fin2B.